Let the bidding begin for this stunning painted by Vanda. This year's Sparkle at the g fashion show event in aid of Tomorrow for Tomás will be take place on September 14th in the g Hotel. However without the contributions from our generous sponsors it wouldn't be possible. L - R Gary Sice, CorofinGAA Footballer, Tómas, AnnMarie & Kate Molone, Catwalk Modelling Agency pictured at the launch of Sparkle at the g taking place on Friday 14th September. With only 25 days and counting to our fashion fundraiser Sparkle in the g in aid of Tomorrow for Tomás Trust it's time to get your tickets now to avoid disappointment. Thanks to an anonymous donator we are so excited to say we have a ticket to this Sunday's All-Ireland Hurling Final to give away. Enter our raffle in aid of Tomorrow For Tomas Trust. Draw will take place on Friday night at 8 pm. Best of luck and we appreciate your support. We'd like to say a massive thank you to all our sponsors for donating so many amazing prizes for Sparkle at the g fundraiser taking place on the 14th September 2018 in the g Hotel, Galway. 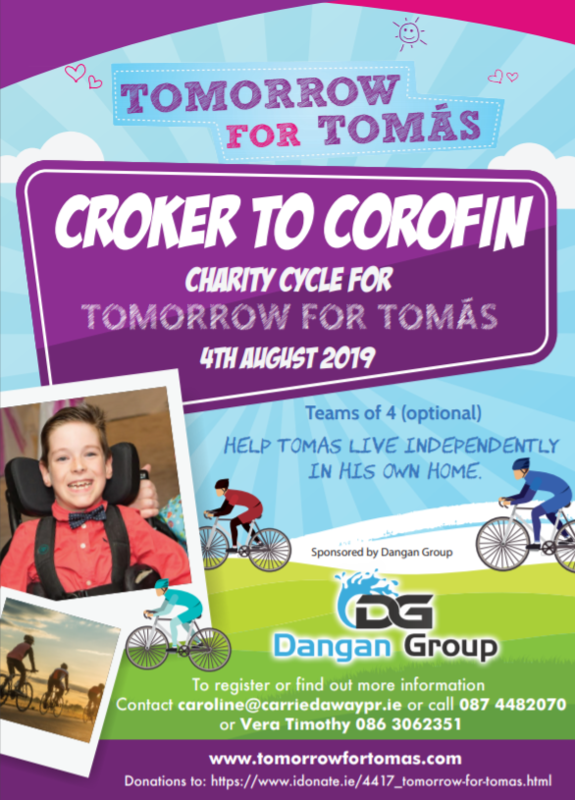 All funds in aid of Tomorrow For Tomás Trust. Your support and generosity is deeply appreciate. We would like to thank you all for your support to date for our trust Tomorrow for Tomás. This year’s aim is to fundraise for costs of adapting Tomás’s family home for his life-long dependent care. The estimated cost of the above is €100,000 and last year’s Sparkle at the g raised €13,320 towards this. Building on our success of last year's "Sparkle at the g" fashion show, we would like your continued support for our flagship fundraiser this year on Friday the 14th of September in the g Hotel, Galway. We would like to thank everyone who supported Sparkle at The g this year. A total of €11,292 was raised which will go toward the adaption of Tomás home. The person with the highest bid wins. Place your bid now and good luck. A little insight into what Tomás requires each week. Thank you to Enable Ireland for providing an invaluable service to Tomás and many other service users. Wow... look at the prizes up for grabs. Save The Date...Friday 15th September 2017 at the g Hotel for our annual fashion fundraiser in aid of Tomorrow For Tómas. Thanks again to our amazing sponsors. Your support is very much appreciate.